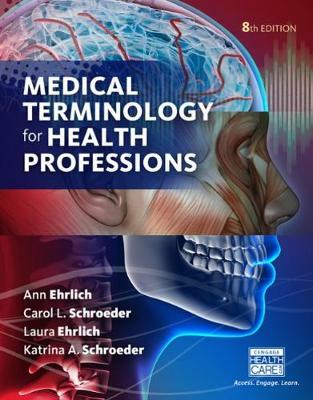 Emphasizing current, relevant, 'need-to-know' terms that will help you succeed in the health care field, MEDICAL TERMINOLOGY FOR HEALTH PROFESSIONS, 8E simplifies the process of memorizing complex medical terminology by focusing on the important word parts'common prefixes, suffixes and root words'to provide a foundation for learning hundreds of medical terms. Organized by body systems, chapters begin with an overview of the terminology related to the body's structures and functions, proceed through diseases and disorders, and end with diagnostic procedures and treatments. A proven combination of learning principles and exercises helps you master the language necessary to describe how the human body works, what goes wrong with it, and how it is treated. An updated art program features the latest terms and procedures as well as multi-cultural/multi-generational photos that accurately portray the opportunities available in today's medical field.